I just had to show you my newest project! You may remember my oak buffet from this post about money laundering, racketeering and tax evasion! What do you think of her now? inserts were painted a pale blue using oops paint and the white mixed together. The buffet was distressed and glazed with Ralph Lauren Smoke and finished with a coat of paste wax . 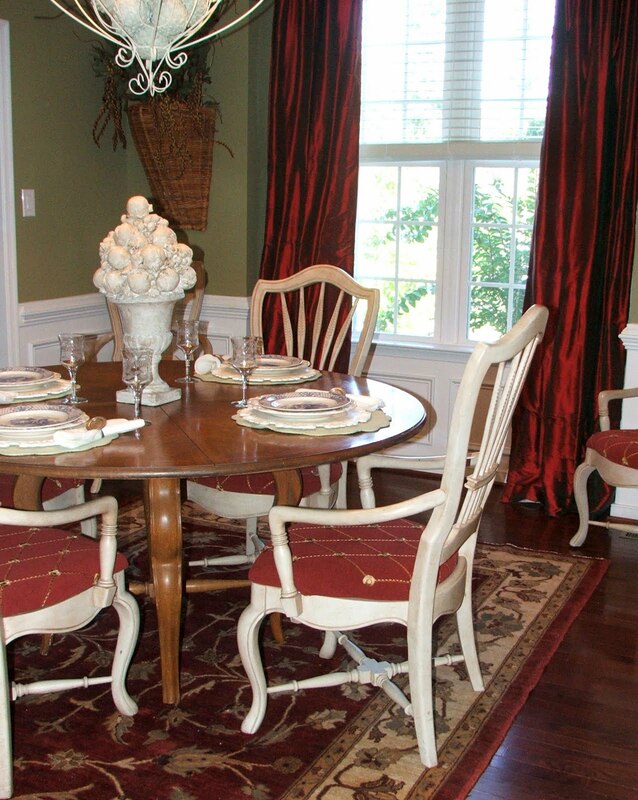 Here are more pictures of the dining room. Now you can see why I chose to add the blue to the buffet. See the white fruit centerpiece on the table? It was given to me at a garage sale. The husband had broken it taking it outside for the sale and didn’t want his wife to know. He told me to just take it before she got home! I glued it back together but you could still see where it was cracked. You can see the technique I used here to repair and age the piece. I am thinking of painting the grandmother clock. What do you think? The clock is new but it was made from antique wood. The silver shelf is a food dome cut in half with hangers welded on. I have a wee obsession with transferware. The chandelier was purchased at the Shades of Light outlet store. Sherry, I just love that buffet painted. What a great job you did, girl. Don't wait so long next time. That clock is beautiful, but would probably look good painted, too. That would be a hard decision to make. I just love love your style and your home is gorgeous. Love that chandy. Some day I hope to replace mine, but hubby sees nothing wrong with the one we have. Men! Oh I do love that white/blue combo…beautiful job! Your buffet looks fabulous. You did a great job painting it! Hi Sherry, Great job on the buffet, the soft blue and white are a great combination. I love the grandmother clock. If you paint her, she will take on a more Swedish look. I also love your cherub mirror. Great dining room. Hi again Sherry, Almost forgot, Cindy at Cottage Instincts has a party too. Make it for Monday. sherry, it looks gorgeous! i love the two toned paint which lends to a nice soft feeling, but the wood teop helps it keep its weight. it really lightens up your dining room! nicely done! Oh Sherry, if you only knew how much I love everything about your home, you wouldn't let me inside for fear I would sneak out with a few things! LOL. I love your cabinet painted and I also like leaving the top natural. Love all your gorgeous accessories and those plates! It looks wonderful, Sherry! I like how you left the top stained wood; it somehow all works together. Funny story about the fruit centerpiece, it looks good here! Love the clock. I've seen pictures of them as painted pieces and they can look really nice. Your buffet is beautiful! 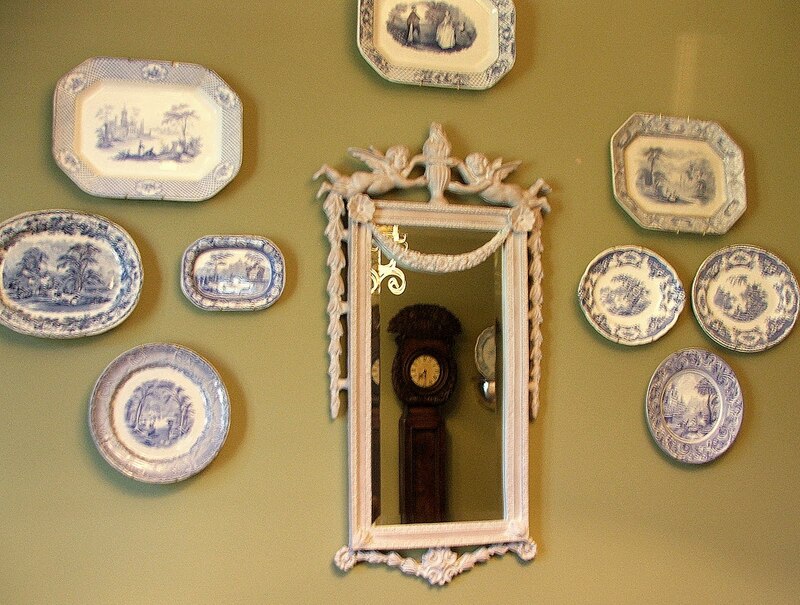 I love all the details in this room, and your pretty blue transferware! I am a procrastinator at times too, so I get that. It was worth the wait! Now, I'm going to be the antagonist here I'm sure. Noooo! I would not paint the clock! It is beautiful as is. If you did anthing to it, maybe only a slight white or off white glaze, to lighten it up if that's what you were going for. I am sure whatever you do will be beautiful though! well..THAT was worth the 2 year wait! Just stunning! Okay I am coming to get that buffet, where I would put it I have no idea!! Seriously what a great job you did!! 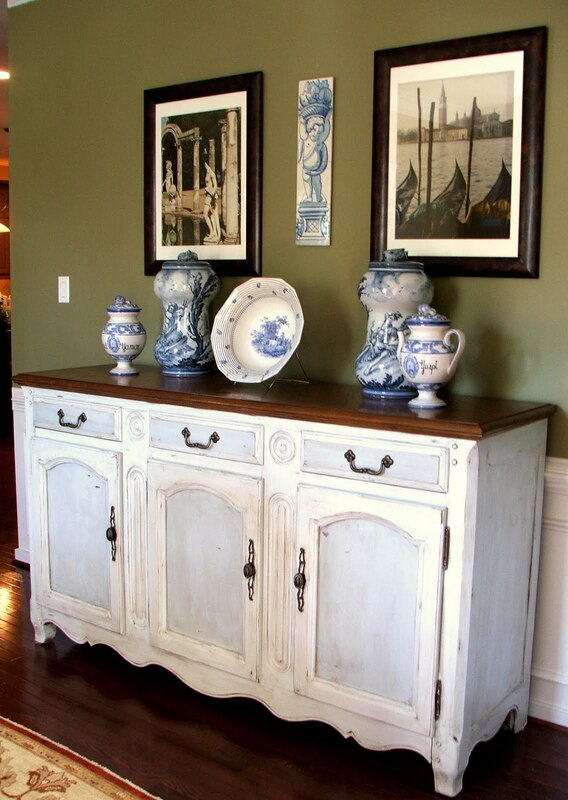 Your buffet looks beautiful painted… so much better! You did a fabulous job. Love all of your blue and white transferware dishes, too! That buffet turned out wonderful! I love everything about that room! What a gorgeous room! I love the paint job on the buffet, what a difference! The room is so put together! Thanks for sharing this!! I don't think I can handle it anymore Sherry! It is just so amazing how you took something that was already beautiful and sent it into another stratosphere! So GORGEOUS! I loved getting to see more of your dining room to and it is totally motivating me to continue my quest to warm up and "un-stuff" my own! WOW! Love it…the blue paint inside the doors really pulls the details out! Your dining room is beautiful!!!! Just gorgeous! I am trying to stop drooling long enough to write you a comment on your lovely dining room. Your paint choice for the buffet was perfect. Your chandelier, transfer ware and especially that silver shelf are all absolutely beautiful. I am inspired! Thank you for your sweet comments on my new blog. I am a follower!! 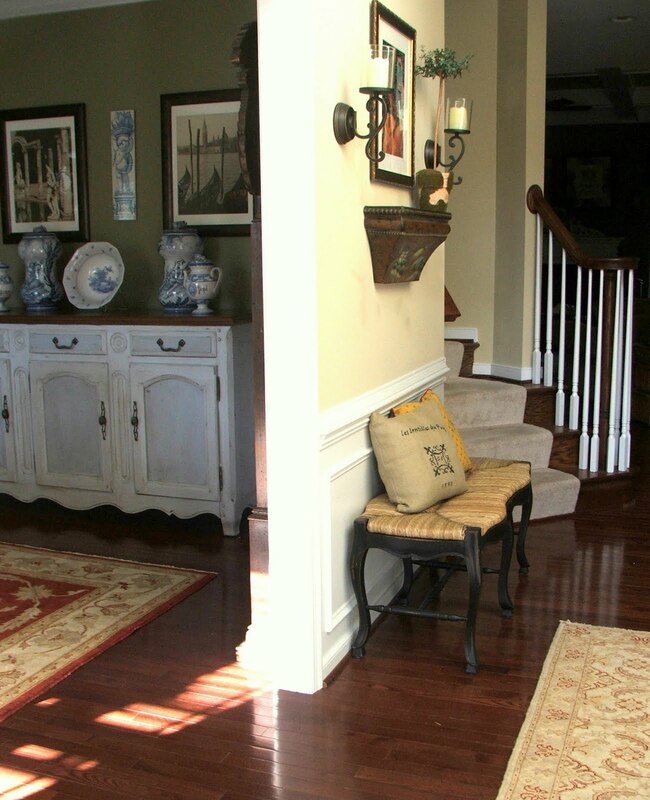 Wow Sherri…your entire space is GORGEOUS! I love it! The buffet is stunning! 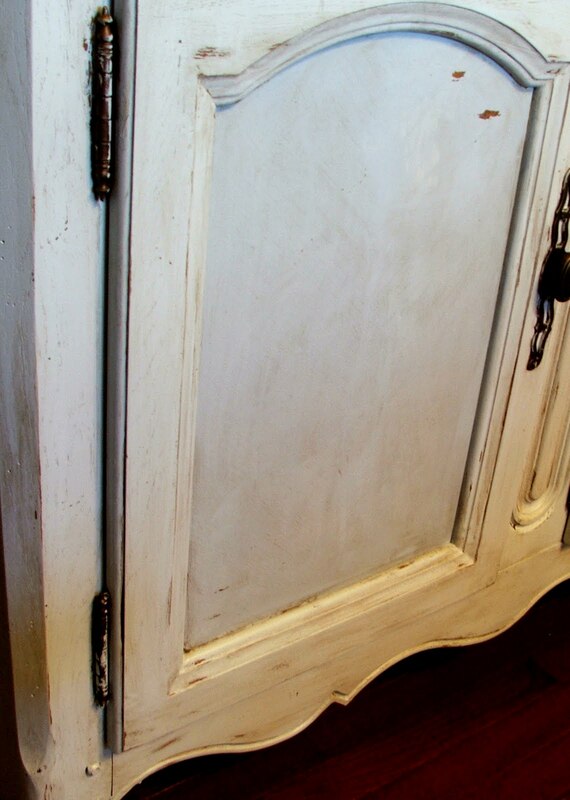 I love the paint and distressing! Wow…again;)! I love your chandelier…the plates…the clock…I love the whole room! You have a beautiful sense of style…I am feeling inspired;)! Thank you! Don't paint the clock!!!!! 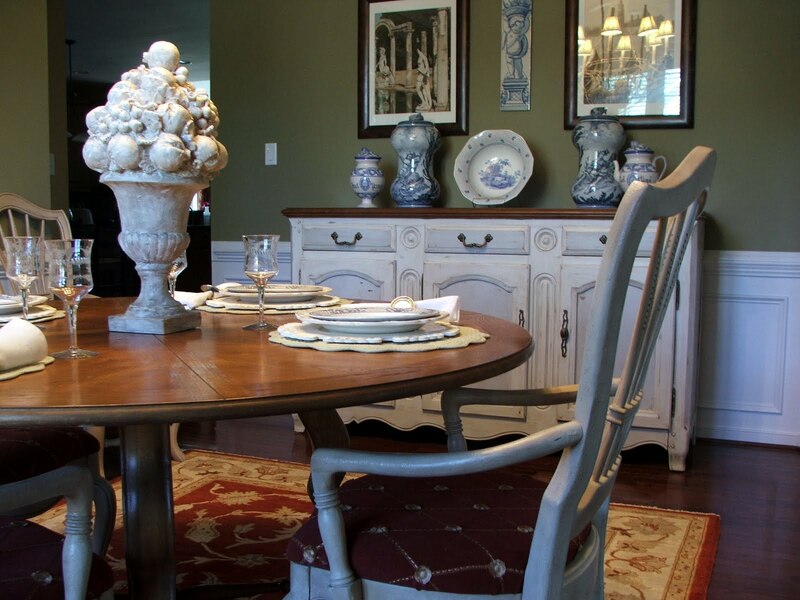 The buffet looks great… but DON't paint the clock…ack! The buffet is gorgeous! I like the hint of blue in the insets. I'm also on the band wagon of "Sherry your home is beautiful". All I can say Sherry is absolutely stunning!!! Amazing! Love finding new inspirational blogs to follow….happy to have found yours! Sherry, your dad must be one hard working young man. I hope I am in that kind of shape at 85. I highly doubt it. You should post what he did. I would love to see it. WOW – it is gorgeous! You should be so proud of yourself! Wow Sherry, this is just gorgeous, glad the crazy man from Craig's list never found you! Your paint technique is wonderful, love the pale blue inset! I love the grandmother clock & think you should paint it similiar to your buffet. Absolutely gorgeous! And oh how I love that half dome shelf!!!! The room is lovely. You did a wonderful job on the buffet. I wouldn't paint the clock. It just looks special as is. Thanks for sharing! just my thoughts,, but NO on painting the clock.. the rest looks good and a mix of wood and painted furniture looks so great.. Your buffet is wonderful!! Love the buffet, but I would not paint the clock. I think if everything is painted, it might get "lost". I love your room! Beautiful buffet. Love it. You did a wonderful job. I wouldn't paint the clock. Nope, clocks just should not be painted. Thanks for sharing. Gorgeous vignette. Enjoyed the tax evasion story too…is that sick of me? If it were me (and it's not!, 🙂 I wouldn't paint the clock. I like the blend of woods. Thank you for sharing your piece in your beautiful home. Ohhh I love it!! You did an amazing job! And I am a nay on the clock front too! You are so sweet! Thanks for the visit.. what did you decide with the clock, paint or no paint?? I love what you did with it-it looks wonderful-great transformation! Have you heard about the new blog party I am starting? It's called Let's Trade Houses. I get to choose someone to swap houses with…and I choose you!!! I do love that paint treatment! And I think the clock would be divine painted! I think it looks beautiful! I love your clock just as it is! Oh, the buffet is soooooo much prettier painted. I think the clock would look amazing painted, but well, you have seen my house right. If I could paint my leather sofas I would. Giggle. WOW…your sideboard looks outstanding…love the look! I'm not sure about the clock. Everything looks beautiful, and I love, love the clock. In a way I would hate to see that beautiful wood painted, but that's just me! Beautiful result on the buffet! Don't you just love what it does for your room? Lovely! Love your painted buffet. I am in awe of your courage, it was pretty before. Don't know if I'd have the courage to paint the clock, but if you do, I know it will be amazing. Hi Sherri! What a awesome job you did on that buffet! How did you manage to wait so long to slap paint on it?? lol! Beautiful job, girl! And yup – have a white-paint-obsession, I'd certainly paint the clock. You distress so beautifully, and it would look great on that clock. Happy WW! I love the buffet! Just lovely! The clock is such a nice contrast as is. That is so gorgeous! I love the blue mix, really makes it romantic. The buffet is absolutely beautiful! I love the white with the subtle blue and the dark top…it really pops. Great makeover, it looks fantastic! SO SO SO pretty! I love the after! Hi Sherry, I have just found your blog and read many posts. I can see that you are Queen of the Paintbrush! You really can find a bargain and turn it into something special. I recently moved from a little town west of Richmond to Connecticut. This summer in VA was too hot and we are enjoying cooler weather here. Even turned the heat on this morning. The challenge here is to sort through my belongings and put my eclectic furnishings together to look nice. Many of my things have been in storage and are together for the first time in many years! Thanks for sharing your ideas. Loved reading this post and your room turned out beautiful! I think the clock would look great painted and since it's new why not? Of course, you know you're on a slippery slope — I can envision a lot of painting ahead LOL. Hope you'll stop by and see us. Jane F.
Thanks for pointing out the centerpiece. I have one just like it in the closet left behind by old tenants and haven't thrown it out yet. Now I have a new project. Love it! And no don't paint that clock! The buffet looks fantastic painted…and I BLESS you for letting us know how long it took you to do it; makes me feel better about the backlog of furniture here waiting for new coats of paint! As for the clock — that wood is beautiful, with marvelous patina. I don't think I could bear to paint it. Oh, it looks beautiful. I love the look of white against the dark wood floor. You did a great transformation. Oh I love this buffet redone, fabulous. Glad you left the top the wood too. And I would leave the clock as is, I thought it was an antique and it ties in nicely with the buffet top this way. I think we have the same drapes! Love your wall color, love it all. I enjoy a good home tour! So many things I like in this room I had to tour it again. Loving the transfer ware on the wall , light fixture. It all works for me! It looks wonderful. The piece really pulls the room together. I think the clock would look wonderful painted. My goodness girl — you are one busy one! I really think the white is so comfortable and looks so at "home"
Thanks so much for joining with us on Fridays… such a delightful stop. You have a lovely home, and the buffet looks wonderful. Wow, you did a SUPER job! I absolutely love it. So much better than my feeble efforts. Thanks so much for sharing this link with me! What a gorgeous space. And, I love that Venice print above your buffet! WOW! that is an amazing change. Can't believe a typical oak looking piece could look so good. If you decide to do the clock, I'm sure it will look just as great. Well, I haven't read everybody else's comments, but I think the clock is GORGEOUS like it is. I've never seen one like it before. I also love your half dome shelf. So stinking cute! You have so many beautiful things and the buffet fits perfectly with your room now! I like how you did the pale blue mixed with white. I love, love, love the fruit urn centerpiece too! I have been looking for one of those at garage sales and I am envious that you got yours for free! I think I would leave the clock as is so that it can retain it's antique appeal. Painting it will make it look like a wanna be clock, leaving it would be more authentic. And it's not as if it doesn't fit in with the mix of painted and unpainted items you have. Your home is lovely, by the way! Your sideboard is beautiful, Sherry! I adore the subtle blue panels. So pretty. Your home is beautiful. As for the clock, I like it as it but am not opposed to painting it…whatever makes you happy! What a beautiful house you have, everything is so lovely. I also collect blue and white plates, etc. and seeing yours so wonderfully displayed makes me want to get more (don't tell my husband!). Sherry I found your blog from Ms. Mustard Seed. Loved the work that you did on the buffet and everything. I wanted to share this with a friend of mine, but it would not take it. Could you send her your blog on this. Her name is Lisa and her email address is: atk555@bellsouth.net. I would really appreciate it and know that she would love it as much as I do. By the way my email address is: bjwhatley@yahoo.com. Thanks and a great job. I LOVE your tall clock!! Where in the world did you get that? It's beautiful and I love your home! Your home is beautiful and the buffet came out great. I am also a lover of blue transferware and have it hanging all over my house. I would love to know the color on your dining room walls. I love it! Glad I found you. Love your french house design! I have an almost identical buffet in my dining room that matches the dining room set, but can't get up the nerve to paint over the beautiful fruitwood. 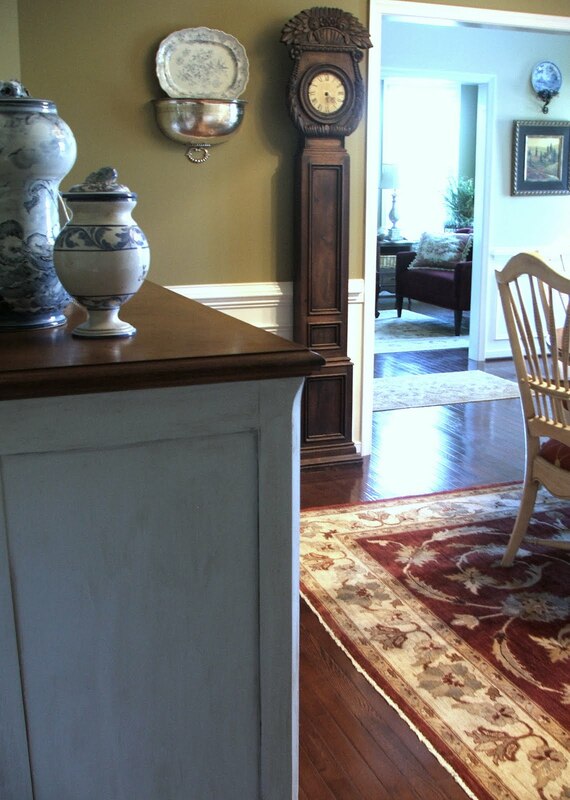 Hope you haven't painted the clock…think it would be too much white in the room and the contrast adds another dimension. So glad I found your site! Beautiful. 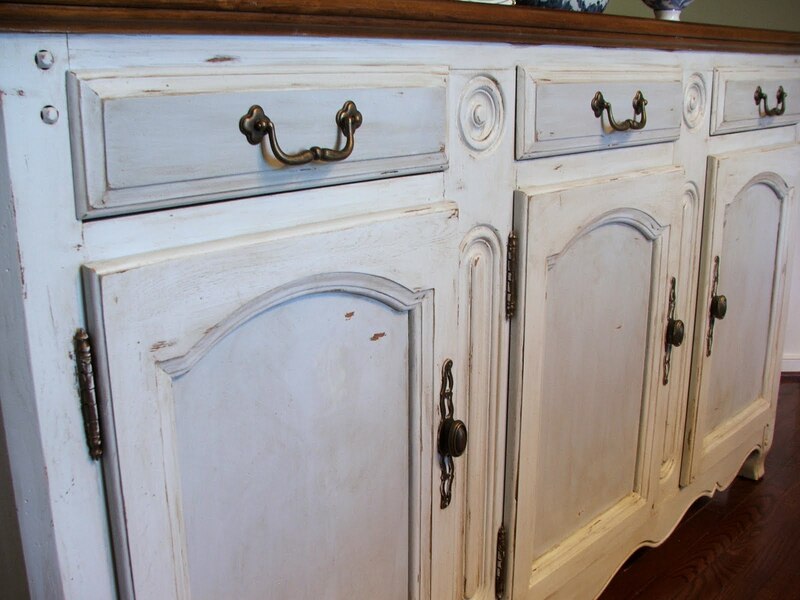 Did you use the Chalk Paint you blogged about making on these pieces? I re posted your Make Your Own Chalk Paint on your behalf with your blog name as the maker! Firstly thank you for becoming my latest follower and for the opportunity of linking up with your site. I love the paint job you have done with the cabinet, I can't wait to start on a few more pieces of furniture. My table was my first attempt and now I think I now exactly what to do to achieve the real "shabby" look next time. I have had a fun time hopping around your blog and viewing your house,its so inspiring to see inside other peoples homes and I have had a few ideas from yours with displaying some of my blue and white china…also a reminder that I need to update my camera to get some photos up on my blog of my own home. I hope you managed to find the post on "French shutters, my bedroom makeover", I think you will love it, I will share it next time. Georgeous pictures and so lovely to see the sideboard painted.. personally I would paint the clock that would make it look more modern and swedish in design.. what did you do with it anyway!! Sherry, You have exquisite style! Love, love, love the painted buffet. It looks excellent! 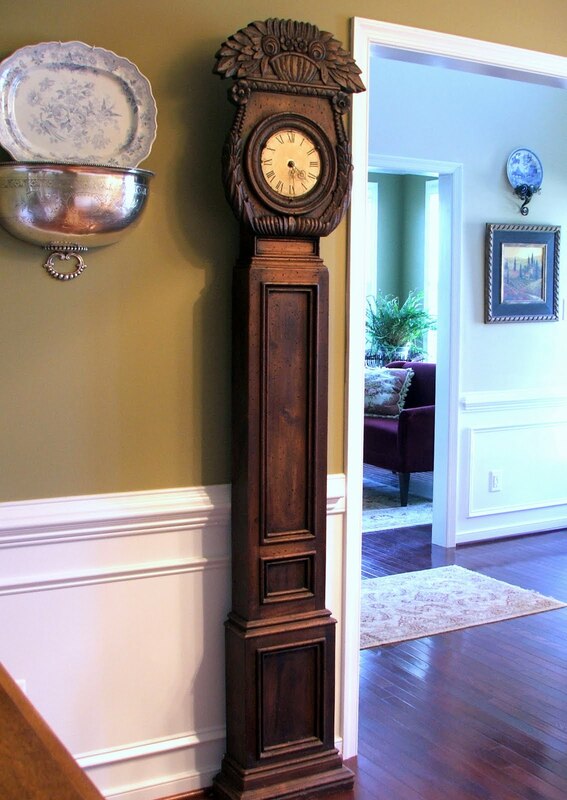 As for painting the clock, it would look fabulous but I like the mix of painted wood and then natural wood togehter because it adds some textural interest. Love your chandy. How fun to be able to decorate and change the chandy for the seasons. I love that new re-done table! It looks so good with the new white and the new accessories on top! I love decorating with the motto less is more. I just re did a table like yours and placed my new favorite home decor jar. I forgot that I was supposed to look at the buffet…SOO busy drooling over the other details!!! You have an amazing style!! !